Why Should I Sign This Petition? How to Answer. Why Should You Sign a Petition? The final installment of our series on successful petitions deals with the all-important signature. How do we inspire people to sign? Can a simple signature make a difference? Many people ask themselves these questions when faced with the idea of signing a petition or adding their name (and potentially their contact information) to any cause, no matter how worthwhile. SHOULD I SIGN A PETITION? Every person that sees your petition will be asking this question. So why should they sign? Signing a petition is a way to participate in the present and create the future. Each name adds legitimacy to the campaign. Signing a petition is a way to demonstrate which issues matter most to you and participate in the process of change. Signing and sharing a petition allows your friends and family to discover and support issues important to them. Your signature demonstrates to the target or decision maker that the cause is important to your community. There is a growing body of literature about how online petitions DO eeffect legislation and public opinion. Your signature is really making an impact. People may feel hesitant about adding their name to a cause for a variety of reasons. Helping others overcome these concerns can go a long way to increasing your total signature count. People think their signature won’t matter. Remind people that it takes thousands of bricks to build a house. One voice may seem weak, but banded together, our voices echo deeply. The petition target will never agree. Remember that nobody likes to be the bad guy. A petition with vocal support can sway a target that is previously stubborn or a target that simply is unaware that their actions and policies are contrary to public desires. Change doesn’t happen overnight, and we have to be patient. But the more we speak out, the closer we get to a better world. People think their information isn’t private. Assure your supporters that the information in a Care2 petition is shared only with the target during petition delivery unless you sign up for more information from our partner organizations. You can even sign a Care2 petition and hide your name from public viewing. The petition has already reached its goal for signatures. 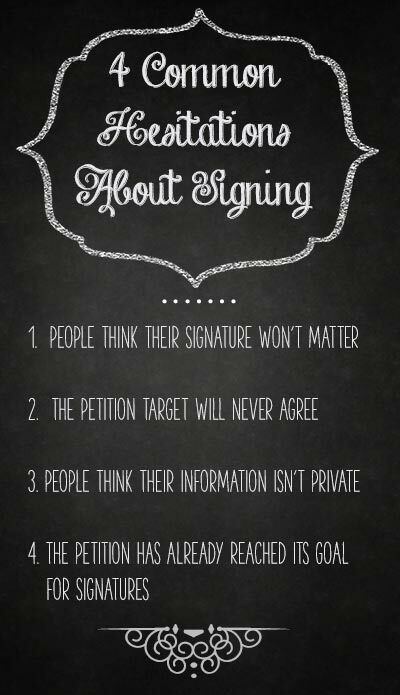 A petition can have increasingly larger signature targets as a campaign grows in momentum. The more signatures, the better! Our Care2 Petitions are easy to search and filter in order to find the issues you care about most. Start by browsing our active petitions; you’ll see that petitions can give a boost to a wide variety of ideas and issues. Signing a petition takes just a few moments. An extra minute to add a personal comment to the target goes a long way to add unique personalities to the common cause! Whether you choose to start your own initiative or join forces with existing petitioners, your unique voice can be heard loudly and clearly by participating in the petition process. Don’t let these important issues pass you by; jump in the ring and use your own personal power to create beneficial change for yourself and your community! Still have questions? Email our staff for the quickest and easiest ways to get started. Send us a note at petitionnullquestionsnull@care2nullteam.com. Or, if you’re ready to start something extraordinary, start a petition right now!